This recipe is so dead easy it isn't even much of a recipe. They can be made start to finish during a commercial break and you can be back on your couch with your little sister watching So You Think You Can Dance, if you're into such things. Which, I am. We are big fans of popcorn in this house and these little gems satisfy that salty sweet popcorn-y place in our hearts. Definitely hot tamale train worthy. 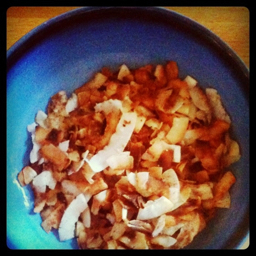 where did you get your coconut chips? I get them in the bulk section of freddie's. Her website also shows tons of variations for spices. YUM!